See how Ollie Shaw progressed in actor and character! Out of the 28 Blondie films made, the character of Ollie Shaw appeared in 19 of them. There were various incarnations of the Ollie Shaw character and four different actors who portrayed him throughout the series run. The most famous version of Ollie Shaw was played by Jack Rice. 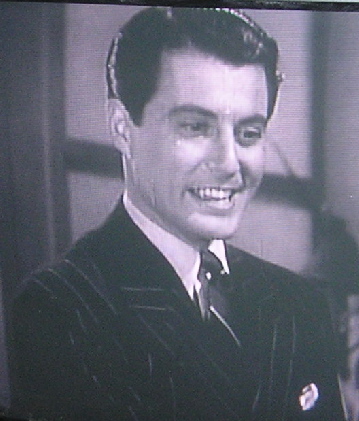 It was the combination of Rice's look and character's personality that has imbedded his image as Ollie Shaw best in the minds of Blondie movies fans. He was a conniving, slippery, weasel of a man who was often a turncoat to friend and co-worker Dagwood Bumstead. His thin mustache, slicked-back hair, and beady eyes shielded behind thick glasses matched his rat-like persona. Here is a breakdown of the Ollie Shaw character taken in order of film appearance. Stanley Brown as "Ollie Shaw"
THIS is "Ollie Shaw"? He's a little too good-looking to be the "Ollie Shaw" most of us Blondie fans are familiar with. Jack Rice, who later became "Ollie Shaw", was also in the film Blondie Meets the Boss, but as a different character. He was the "Detective With Mason". Frank Melton as "Ollie Shaw"
As you can clearly see in this film, "Ollie Shaw" put on some weight and lost some hair. Jack Rice as "Ollie Shaw"
Norman Phillips, Jr. as "Ollie Shaw"